The jewelry you choose to go with your clothing should not be made by chance nor solely by how much you like the particular piece. Each piece must add value to the outfit. It should not overwhelm, nor go completed unnoticed. If your outfit is colorful or intricately patterned, don’t overdo it with complicated, large colorful jewelry. The same rule applies to ruffled, sequined, embroidered, or other embellished garments. Complicated accessories with these types of outfits will make your outfit appear cluttered and unorganized, maybe even gaudy (the exception here is earrings – If your outfit is a colorful, casual outfit, big colorful earrings look great). Instead, when wearing a complicated outfit, choose simple jewelry like solid bracelets, watches, and earrings. Similarly, if the outfit is simple, wear colorful bold jewelry to add spice to the overall look. Metal pieces can be spiced up with color too. For instance, add colorful woven or beaded bracelets or layered colored gemstones necklaces with gold and silver jewelry. It is especially important to not wear too many pieces. Too much jewelry draws attention to the jewelry and away from the outfit. Too many bracelets will look clumsy whereas a single, bold necklace on its own may be enough to complete the outfit (necklaces are very good attention getters). The 16-point rule can be used to help determine how many and what type of pieces should be worn. Always begin with a centerpiece. A statement ring, large bracelet, or large watch are examples of centerpiece jewelry. Then add pieces that are smaller but not as flashy. Layer jewelry of different sizes. Mix thicker pieces with thinner pieces or larger piece with smaller pieces. Bracelets can also be layered with different types of bracelets to add variety. Match your jewelry to the environment. For instance, don’t wear dangling jangly jewelry to work. Wear conservative jewelry to church. But if going to a party, make sure your jewelry choices look like a party. Formal outfits look best with gold and silver jewelry. When wearing metal jewelry, it often works well to mix different kinds of metal jewelry. Mix silver, copper, white gold, and rose gold for a wonderful, unique look. And of course, diamonds and cubic zirconia jewelry go with anything. Rings can really add pop to an outfit, especially if they match the outfit’s color. Remember though, rings draw attention to your hands so make sure your nails are well-manicured or the ring will look out of place. Stack rings have become very popular and are a great way to spruce up your look without breaking the bank. You can stack multiple rings on a finger or spread rings around several fingers. Big earrings, which draw attention to the head, required your hair be drawn back or straightened. On the other hand, small earrings look great with large, noticeable hairstyles. The choice in necklace depends both on the shape of your face and the neckline of your top. For instance, V-necks look best with v-shaped necklaces and squared pendant necklaces look best with square necklines. For detailed information on matching the necklace to your body type, face, and neckline, see this special feature. 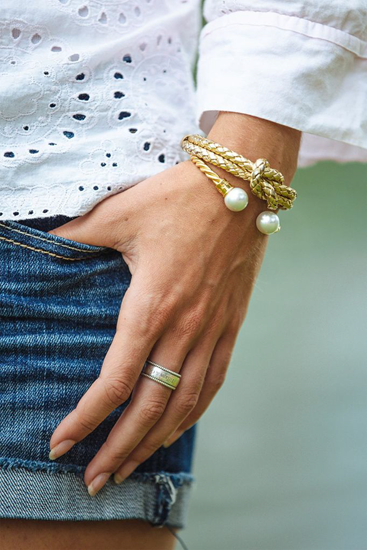 It is rare that an outfit does not demand a bracelet, a piece that can be layered and stacked to offer endless variety. Finally, always clean and shine your jewelry before wearing it. Jewelry will never contribute to an outfit’s look if it is dull and dingy.